Easy BookBinding, by Nathan DeStephano, is the most current and complete resource I have found for learning how to print and bind your own trade paperback and case bound hardcover books. Easy BookBinding is written for the self-publishing author and people who want to bind the many electronic books that are piling up on their computers. 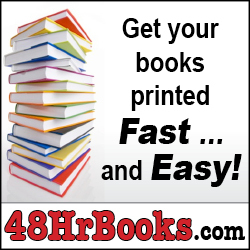 It will teach you to make trade paperbacks and case-bound hardcover books cheap and fast. These are the most common styles of books you find at your local bookstore. Personally, I get lots of e-books every month and like to have hard copies of the good ones to read during my commute to work and make notes in. I also like to download public domain classics from the Project Gutenberg website and create printed copies for my library. Occasionally, I make collections of my photos to share with family and friends (this option has become much more popular since the birth of my daughter!) 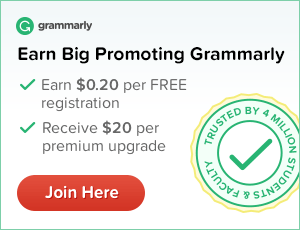 You may have a collection of poems or short stories that you want to share. Whatever your reason, finding good information on bookbinding is challenging. Most sites I found that taught more modern methods are either badly done or don’t show enough detail to get you through the whole process. You have to get a little info here and a little more there and invent your own method through trial and error. Saving you from wasting time experimenting is where the real value of Easy BookBinding shines through. 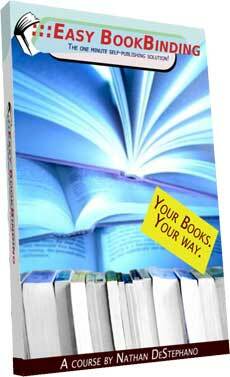 Easy BookBinding takes you step-by-step through the entire book creation process. There are tutorials for using a free page layout program (and information on where to get it) to design the cover and interior of your book. Three different binding methods are explained and there is even a set of plans for building your own binding jig to speed up your process. Easy BookBinding does not leave you with general descriptions of the process and rough sketches. Every step is shown in detail with screen captures and high quality 3D images along with measurements in imperial and metric units so the information is useful around the world. 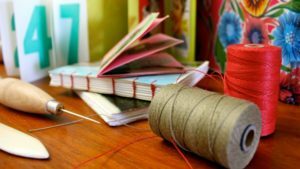 Easy BookBinding is a practical step-by-step guide to making your own trade paperbacks and case-bound hardcover books. I recommend it to anyone looking to shortcut the learning curve and start making high quality books. For more information visit the Easy BookBinding Website. How do I buy the book, or is this book onoy offered on the internet? I was just having a look at your website as I am trying to make little bound laminated wildlife booklets for our customers (12 x 16 cms roughly) I was wondering if you could give me any help as I have collated all the information but am not quite sure how to go about actually putting the booklet together or binding it. Any help would be much appreciated. If you are dealing with a small page count (24-32 pages or fewer) I would create a simple staple bound booklet folded down from a letter sized sheet of paper. If your design isn’t to complicated, use a word processor to bring everything together and use the built-in booklet printing tools to get the pages in the right order for printing out. This is what I do. Add headers, footers, and page numbers to give your books a professional look. I recommend finding a book in the bookstore that has a similar style to what you want and modeling the interior design to guide your own project. Check out the articles on covers here for info on laminating your own covers.